Are Veblen Amundsen-Hovda and Paul Vreeland, engaged to be married after a mere few months of dating, truly compatible? Or are they clinging to each other as ports in a dysfunctional storm? Veblen’s mother is possibly the neediest, most manipulative hypochondriac on the planet, while Paul’s pot-growing, aging-hippie parents have prioritized Paul’s mentally disabled brother Justin over Paul all his life – or so he feels. Veblen, who has Norwegian ancestry and is a fan of her namesake Thorstein Veblen, the anti-consumerist economist and socialist (famed for the idea of ‘conspicuous consumption’), has grown up anxious, finding comfort in strangeness, solitary pursuits, nature and in particular squirrels, with whom she converses. Paul, less outwardly eccentric and more mainstream when it comes to capitalism, has qualified as a doctor and inventor of potentially life-saving equipment, but has recently fallen into the merciless hands of big pharma. 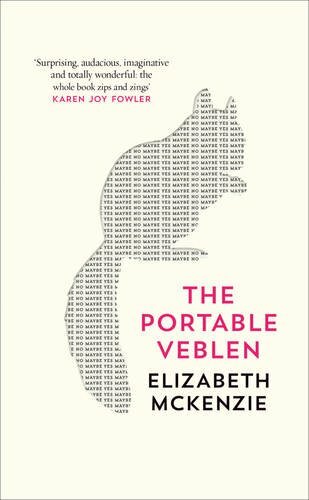 McKenzie’s novel, set in the rapacious territory of modern California, looks at life and her characters through the opposite end of the kaleidoscope. 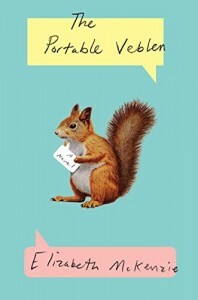 A little like Miranda July’s The First Bad Man, but tidier and with a more explicit political edge, the novel is quirky, the interior worlds off kilter and the field of attention amusingly introverted. There’s undoubtedly some serious charm here, if also, at times, an excessive element of cuteness, notably in the welter of squirrel genealogy and chat, the use of occasional, random photos and some questionable appendices. But the offbeat humour and general brio of this new novel from the author of Stop That Girl are enough to distinguish it from the pack. Again, as with July, we’re in the land of kooks, and it’s an entertaining place to spend a little time.